Nickelodeon announced today that WWE Superstar John Cena is returning to host the 2018 Nickelodeon Kids' Choice Awards for the second time, while also breaking new ground at the network with two firsts: Cena will get into character by lending his voice to an original villain named Baron Draxum in the brand-new 2D animated series Rise of the Teenage Mutant Ninja Turtles, premiering late 2018; and is executive producing the brand-new competition series, Keep It Spotless, where teams of kids go head-to-head in a battle to stay clean. Here's what Cyma Zarghami, President, Nickelodeon Group, had to say in a statement about star John Cena. "John Cena is one of the biggest stars in the world. Kids just love him, which makes him the perfect partner for these upcoming projects. His blend of humor and originality brings a fresh voice to Nickelodeon both in front of the camera and behind." 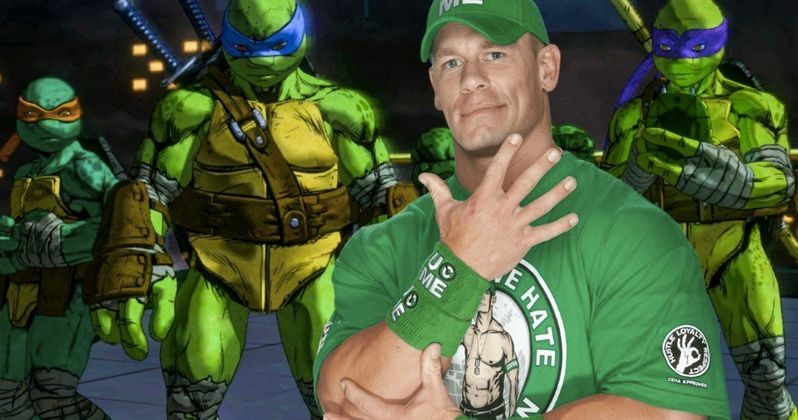 Rise of the Teenage Mutant Ninja Turtles' newest villain, Baron Draxum, will be voiced by Cena. Baron Draxum is an alchemist warrior mutant who seeks to turn all of humanity into mutants. Cena's recurring character will appear in the premiere episode and throughout the series, which follows the band of brothers as they encounter new mutants and villains and discover a mystical world they never knew existed beneath the streets of New York City. Rise of the Teenage Mutant Ninja Turtles will bow later this year. Here's what John Cena had to say in his own statement about all three of these projects. "I'm thrilled to partner with Nickelodeon on three big projects that run the range of what kids love-slime-filled live events, awesomely cool animation and competition shows where kids take their shot at being the best. It's an honor to come back a second time to host the biggest, slimiest party of the year, the Kids' Choice Awards. Not only do I get to be a cartoon character in the new Rise of the Teenage Mutant Ninja Turtles series, but I get to be a villain, too. And to top it all off, I'm stepping behind the camera to executive produce Nick's new competition series Keep It Spotless, which gives a whole new meaning to staying clean." Nickelodeon's 2018 Kids' Choice Awards airs live on March 24, from 8-9:30 p.m. (ET/PT), and celebrates kids' favorites from across the worlds of film, television, music, pop culture, animation and more. With stunts and surprises at every turn, the show will return to the "Fabulous" Forum in Inglewood, Calif., and will be seen by kids around the globe on Nickelodeon channels in more than 170 countries and territories. Additional Kids' Choice Awards news, including categories and presenters, will be announced in the coming weeks. Keep It Spotless, Nickelodeon's new competition series, is executive produced by Cena and features kids competing in a variety of physical and paint-filled challenges designed with one goal in mind-to stay as clean as possible. After each game, a 360 degree scanner will measure each teams' mess to determine just how spotless they really are. The winning team will face The Gauntlet, a multiple-challenge obstacle course, where they can turn their cleanliness into cold hard cash. Keep It Spotless is produced by ITV Entertainment and Hard Nocks South Productions, based on a UK format from Possessed, and scheduled to premiere later this year. Sponsors of Nickelodeon's 2018 Kids' Choice Awards include Barbie, Cinnamon Toast Crunch, Swiffer and Toyota. The presenting International sponsor for the 2018 Nickelodeon's Kids' Choice Awards is Heelys. Nickelodeon's 2018 Kids' Choice Awards is produced by Nickelodeon Productions. Elizabeth Kelly, Michael Dempsey, Shelly Sumpter Gillyard and Jay Schmalholz are executive producers. Rise of the Teenage Mutant Ninja Turtles is co-executive produced by Andy Suriano (character designer, Samurai Jack) and Ant Ward (supervising producer, Teenage Mutant Ninja Turtles) at Nickelodeon in Burbank, Calif. Veteran animation industry voice actor Rob Paulsen is voice directing the series. Keep It Spotless is produced by ITV Entertainment and Hard Nocks South Productions, based on a UK format from Possessed. David Eilenberg, David George, John Cena, Jason Carey and Shye Sutherland all serve as executive producers. Take a look at the video where John Cena announces all of his big projects, courtesy of Nickelodeon YouTube.